The creators include Mikey Anchan, Ayush Thacker, Raga Chilakamarri, Esther Lee, and Ariella Levy. Anchan and Thacker originally came up with the idea of creating Humans of SHS last year. The page was then officially made in the beginning of the 2017-2018 school year. The founders say that their goal is to get to know the people who make up Sharon and their unique stories within the community. 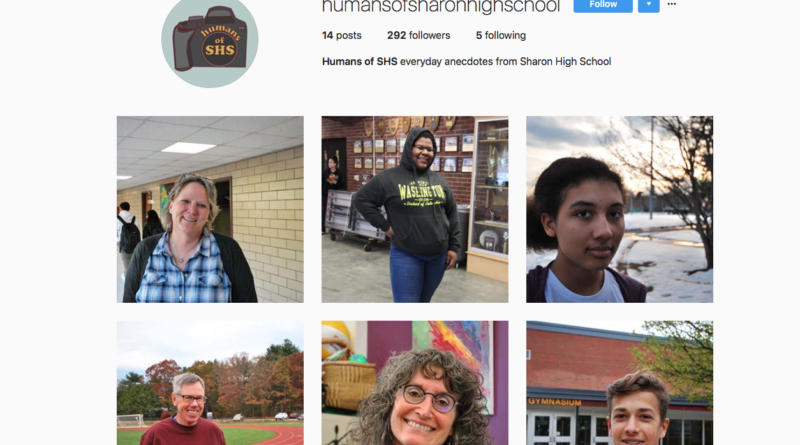 Chilakamarri says that the key reason why she joined Humans of SHS was to get to know people around the school and to come outside her comfort zone. “When you try to talk to people it’s scary, so I thought that this was a good way to get out there,” she said. Levy says that she wanted to join because she has always enjoyed reading Humans of New York posts. “The anecdotes are a mix of funny, sweet, powerful, thought provoking, and sometimes even relatable,” she said. Thacker immediately wanted to be involved with Humans of Sharon High and he thought it was an excellent idea. “Humans of SHS allows students and teachers to share their inspiring stories that would not come up in normal conversations,” he said. Lee joined Humans of SHS as a way to pursue her passion of taking pictures of different people. “[Humans of SHS] has taught me a lot and has opened my eyes to see that every human being is unique and beautiful in their own ways,” she said. Anchan says that Humans of Sharon allows people to learn about stories of those around school who they might not talk to or meet otherwise. “It’s a way to branch out and meet new people, to tell stories of the people who share the commonality of being a member of the SHS community,” he said. He adds that originally, they chose common people around the school but they are now trying to select a variety of people. “The real concept of Humans of Sharon is to bridge new relationships and to meet new people of all different types,” he said. Lee says that Humans of SHS allows for people to communicate and spread ideas with one another. “The interviews are such powerful ways to connect with different people you might not normally talk with,” she said. Thacker says that he enjoys learning about people’s stories and their unique backgrounds. “We believe Humans of SHS will connect our diverse community and allow for students and faculties voices to be heard,” he added. Levy says that bringing the anecdotes to SHS will help students learn more about the people in the building who they wouldn’t know on the surface. “Sharing stories of everyday people help us to create a stronger connection with the world,” she said. Chilakamarri says that Humans of SHS allows for communication and the learning of Sharon’s diverse community. “Everyone has their own story, but you really don’t know that until you talk to them. We’re inspired to promote the idea of community, get to know people, and open up the borders,” she added.